MY LITTLE PONY: FRIENDSHIP IS MAGIC season 5 trotted out on Saturday, April 4, exceeding viewership records and marked the series’ top-rated debut of all time! Season 5 is filled with surprises and special treats for viewers, including the appearance of celebrity guest voice Tony Award-winner Lena Hall, the series’ exciting 100th episode, fun holiday specials and several new, original songs soon to be fan-favorites. Viewers will be introduced to new characters and see background characters brought to the forefront for the first time, all as part of a journey that embraces such themes as individuality, coming of age, facing fears and achieving your dreams. 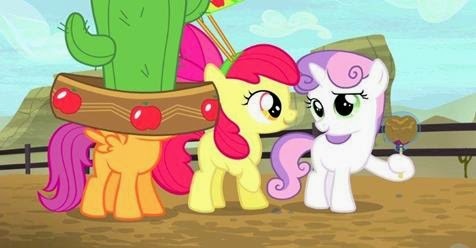 When notorious outlaw Troubleshoes Clyde returns to menace the Appleoosa rodeo, the Cutie Mark Crusaders realize that bringing him to justice might be the key to finally getting their cutie marks.